Having covered music for years and eventually branching out into fashion it was a huge thrill to be invited to visit the Grammy Style Studio. It was great to have the opportunity to meet the designers in person and view their clothing, jewelry, and accessories up close. Hosted by The Recording Academy and Fashion Los Angeles the event was held in downtown L.A. on the 51st floor, which provided a spectacular view of the city. Guests were treated to appetizers courtesy of The One Group. There was an open bar and premium sake samples from Jokigen. Jokigen sake was created by Shoichi Sato, a 5th generation toji, and is brewed at Sakata Brewery. The company even produces sparkling sake – Japan’s version of champagne. Of course a styling suite would not be complete without a little pampering and there were a number of companies on hand offering complimentary services. 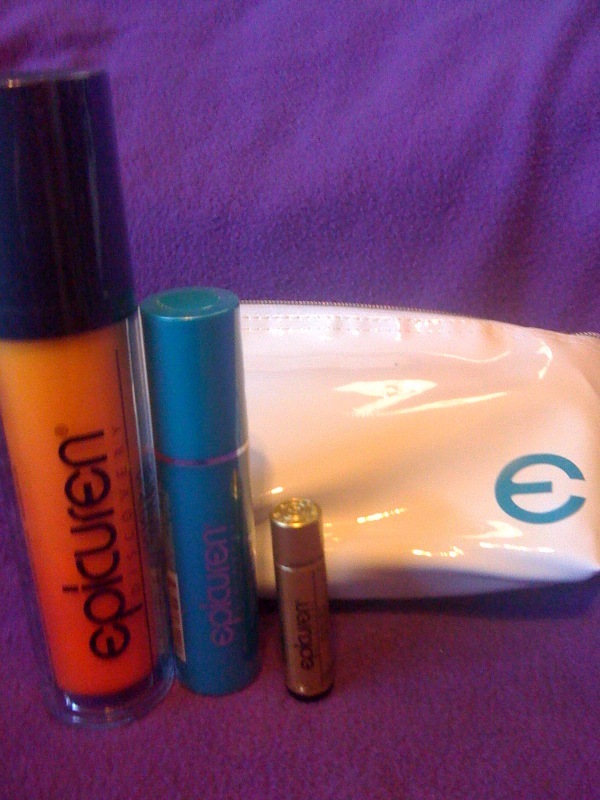 Epicuren provided massages and gave attendees gift sets containing some of their cutting edge skin care products. Epicuren manufactures enzyme and propolis based skin care and spa products that are earth and animal friendly. Their line is sold only in salons and health centers with licensed aestheticians that are trained and certified in Epicuren enzyme skin care. The gift set contained Silk Mist Sunscreen SPF 15, Pro Collagen + Serum Amplifier, and Lip Balm SPF 15 Tea Tree Oil. After a massage guest could treat themselves to a Fake Bake Tan in order to have that last minute sun kissed glow for the red carpet. The folks at Fake Bake have created a revolutionary self-tanning lotion that contains botanically extracted ingredients and no preservatives. The product moisturizes, hydrates, doesn’t clog pores, irate skin, has no harsh odors, won’t streak or stain your clothes, and won’t turn your skin orange or yellow. Someone needs to tell the Jersey Shore crew they need to use Fake Bake! 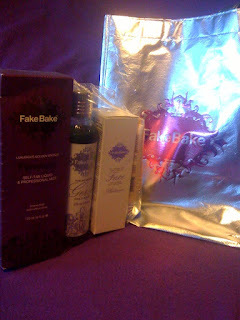 The ladies at the Fake Bake booth were kind enough to give me a gift bag containing the self-tanning product, a daily wash, an anti-aging self-tanning lotion for the face, and a buffer face polish. Once the tan has set ladies could head over to Lily.B and prep their face before apply make-up. Founded by Liz Bishop, Lily.B Skincare was designed specifically to help protect skin and restore its natural health. Celebrity make-up artist Anthony Gordon uses Lily.B products on all his clients. With a face that is super soft and prepped attendees could then head over to Pop Beauty for a complimentary make-over. I love Pop’s products. They’re edgy, colorful, and vegan friendly. The line’s flirty, funky shades are perfect for the Grammys. 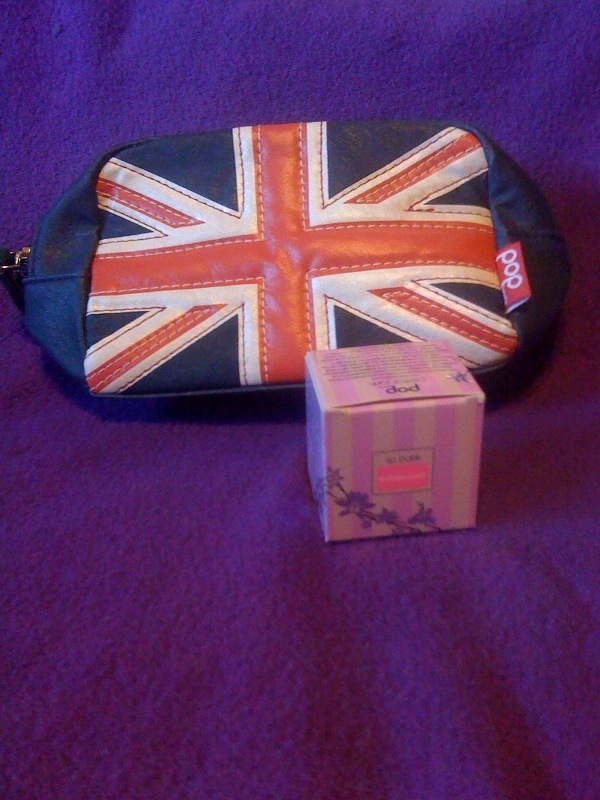 The lovely make-up artist was kind enough to give me some lip balm and a cute Union Jack make-up bag because Pop Beauty is a U.K. based company. Def Jam hosted a gaming suite and lounge where guests could relax and play Def Jam Rapstar. The suite was decorated with artwork by California based artist Daniel Maltzman and featured portraits of musicians such as Eminem and Rihanna. And, representative from Green Technology were recruiting folks to record a PSA for their Save Energy Campaign, which featured the slogan “Only You Can Save Energy”. Be sure to check back for complete coverage of the featured designers at the 2011 Grammy Style Studio. I like Epicuren After Bath Moisturizer gel that always helps me to keep away from the skin problems such as acne and pimples. it can helps to get rid off dark spots.